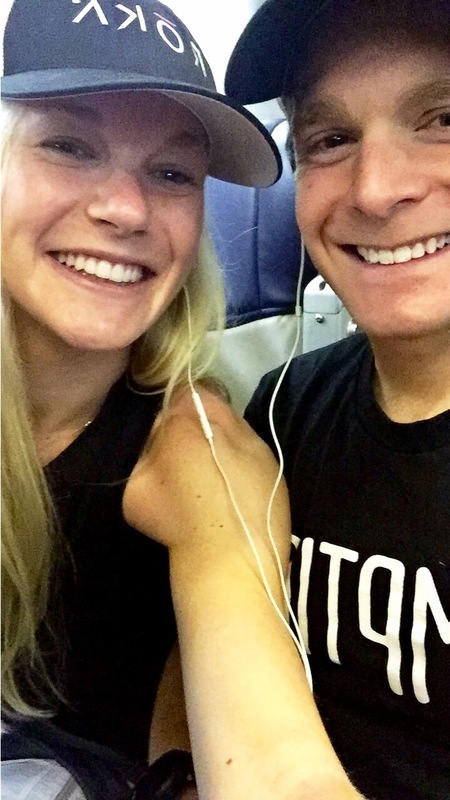 Steve and I were both excited to get away for the weekend and race after a hectic few weeks in the lead up between my finals, life and our move. We had been trying to fit so much into such a little time. 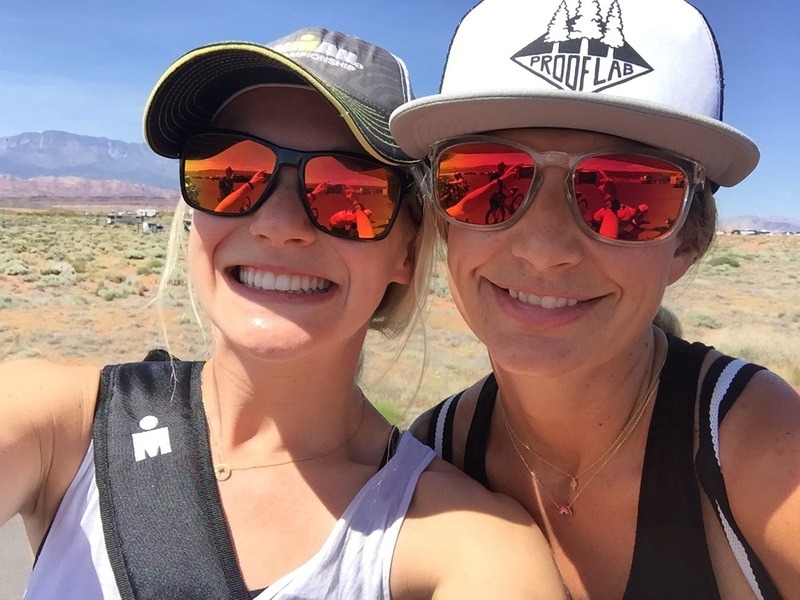 I had finals before, while in St. George in and a few more once I was home, but we were both excited to race and to have a change of scenery for the weekend. We left Wednesday morning for Denver. James, a fellow MP Multisport athlete, picked us up from the airport. 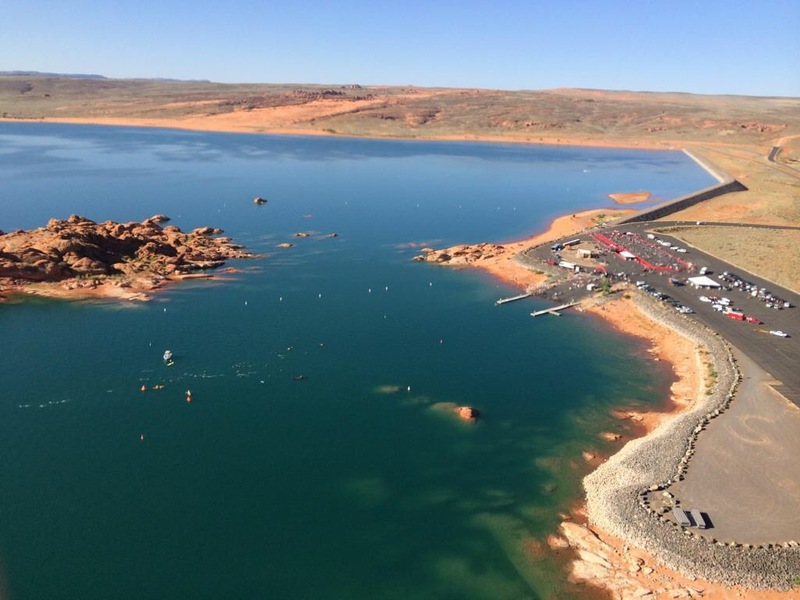 We intended to stop at Jame’s house to grab his things and then continue the drive to St George together, but discovered quickly we had a problem. 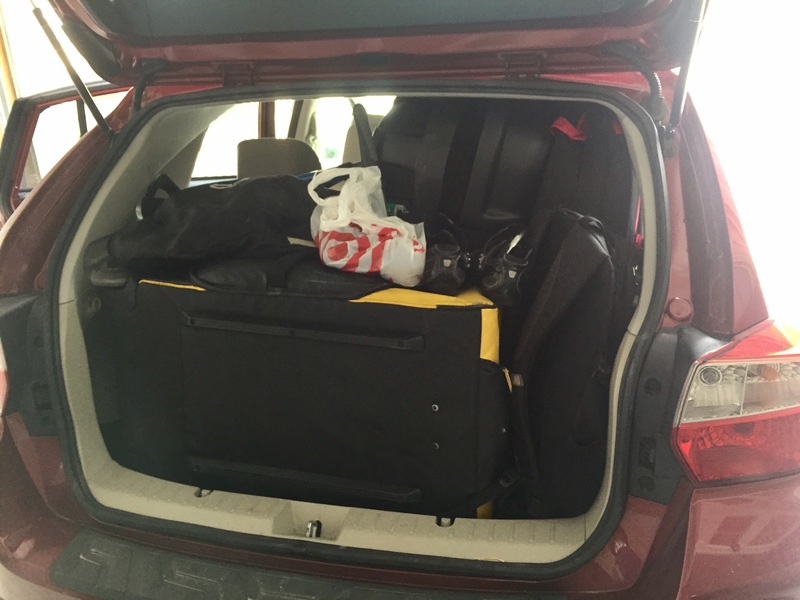 Here were our variables: 3 humans, 3 bikes, 2 bike boxes, 3 duffel bags and 2 bags of food (judge us), 1 Subaru. 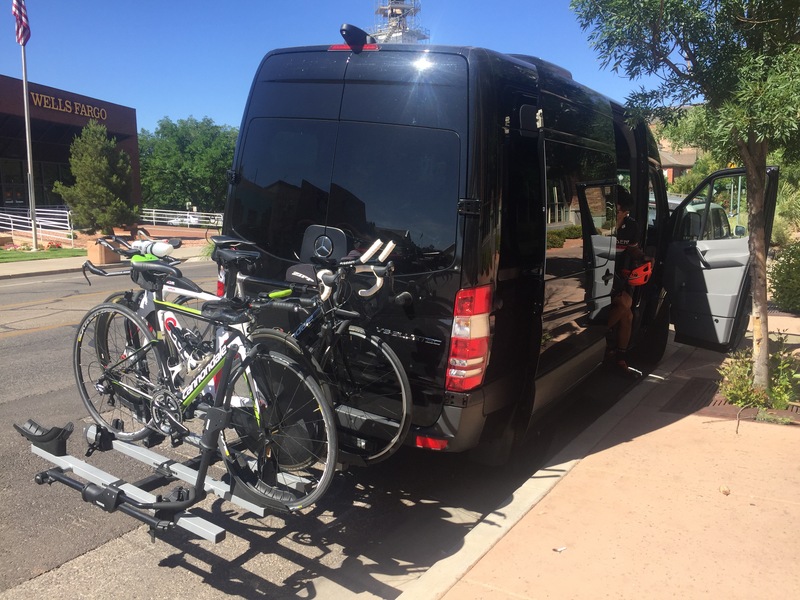 After packing and repacking the car, we finally submitted to building mine and steves bike, putting one bike box inside the other, and putting all bikes on the bike rack for the drive. 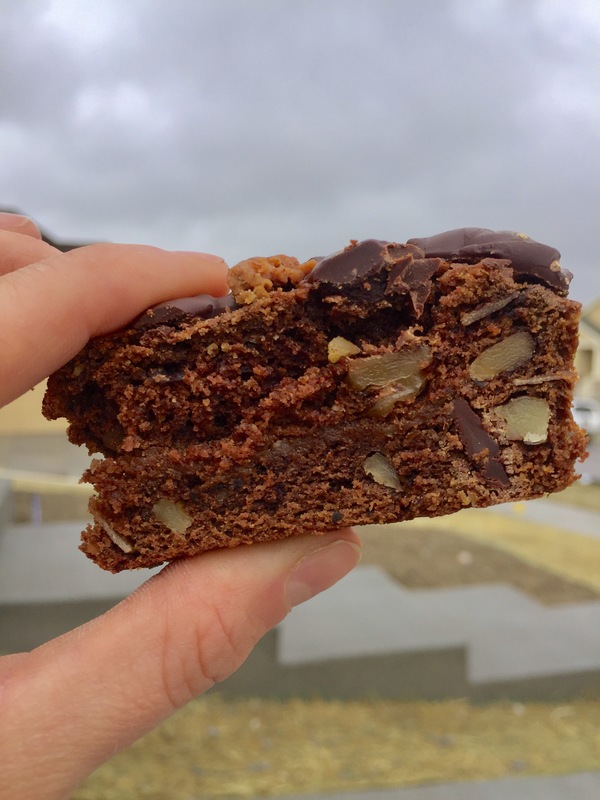 James kept the crew caffeinated and fed with coffee and his homemade chocolate avocado bread. This helped to make the game time decision to build the bikes go a bit smoother. The next morning after much needed sleep, we went to ride the run course. My back brake was rubbing despite my tune up before leaving town. After fumbling with it for some time, I sent the boys on their way and rode down to Red Rock Bike Co to fix it. I was in and out in 15 minutes and, in my true style, left with 5 new friends to go ride with. Riding was a relief to the legs after a full day of travel and helpful in my mental preparation as it gave me a sense of the layout of the course and difficulty. I never doubted that I would finish, I just did not know what intensity I would be able to sustain through the elevation gain and heat. Although I would not know until the race itself, the ride was helpful in this respect. We swam at Washington aquatic center later in the day to loosen, we grabbed dinner and headed to bed with the pact to sleep in as long as we all could. Thursday night would be our last night of quality sleep before the race. Friday looked very similar to Thursday: we swam, we biked (no mechanical issues) and we ate. Minor differences: we went to the pro meeting with Steve, Heather made it into town, we checked our bikes, and I ditched the boys in the motel to stay with H in the Marriott. 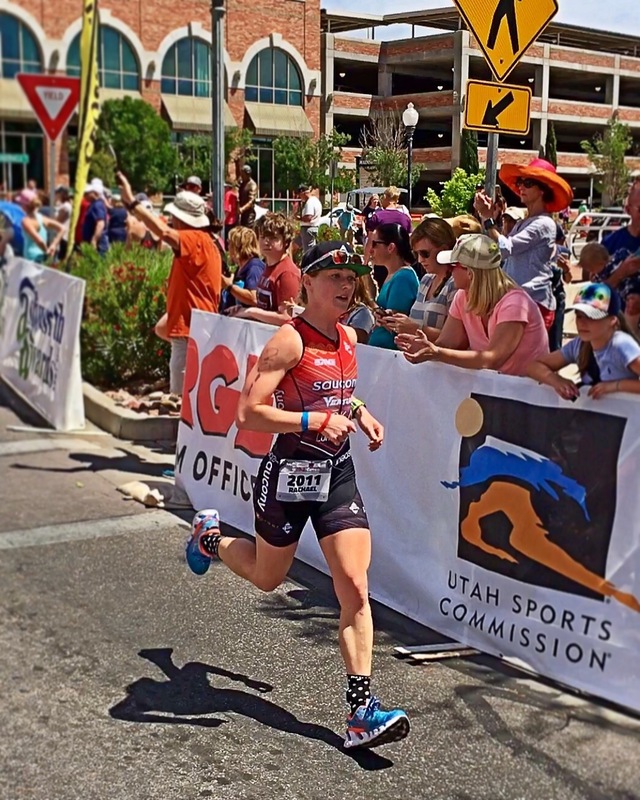 Prior to St. George, I had not raced to my potential in a few hot races due to my nutritional management (Kona 2015, DNF at IM Boulder 2016). I have worked hard to adjust this. While I had executed nutritional wins in big workouts in the lead up to St. George, I knew I would have to be very mindful while I raced. The night before the race, I was calm but terrified.. if this even makes sense. 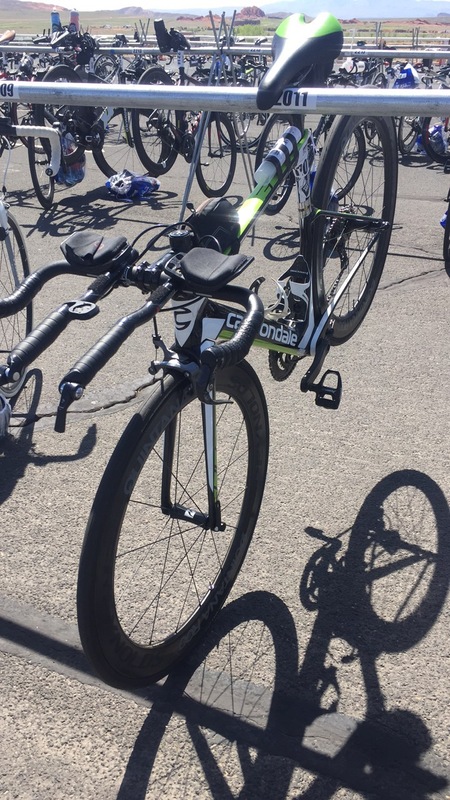 This was my 70.3 debut, in a way. 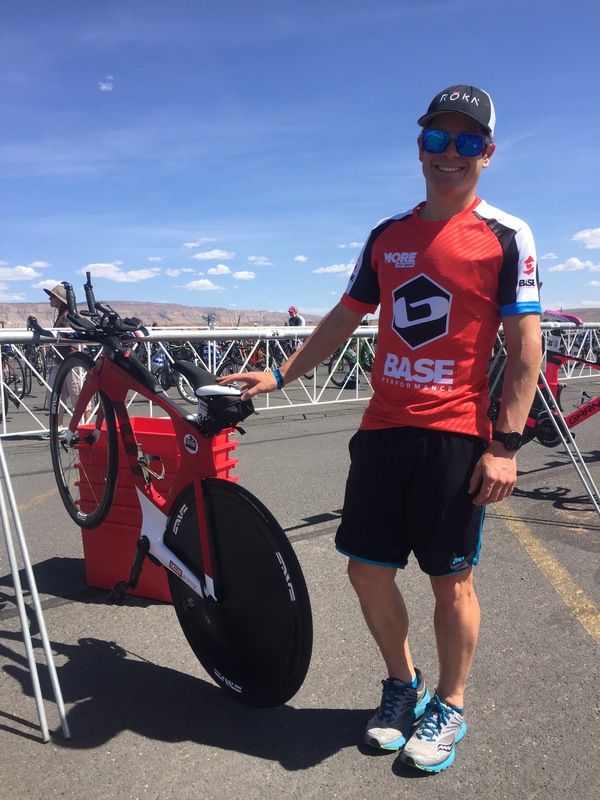 A new challenge I announced to the world I was taking on…(why I picked one of the hardest 70.3 races to do it? I’m still unsure) I love sharing my experiences and my story with the world. I think through sharing our experiences, we can learn from and empower one another and it is SO FREAKING COOL! but in moments- I find myself wishing I was flying underneath the radar where no one would know or care who I was or my race result. Instead of thinking about this, I put my energy into doing what I could to help my race day self. I added additional Base salt to my bike and run bottles, made sure to lay out a race day bra that would hold plenty of ice as I knew the run would be hot, then attempted to sleep a bit before our 3:40 wake up call. Waking up in the 3’s always comes too soon. H and I stumbled out of bed and down to the “Ironman breakfast” the Marriott held for athletes from 4-5 AM to grab oatmeal, coffee and bagels. How sweet is that? We headed out of the door and down to T2 to drop run gear. 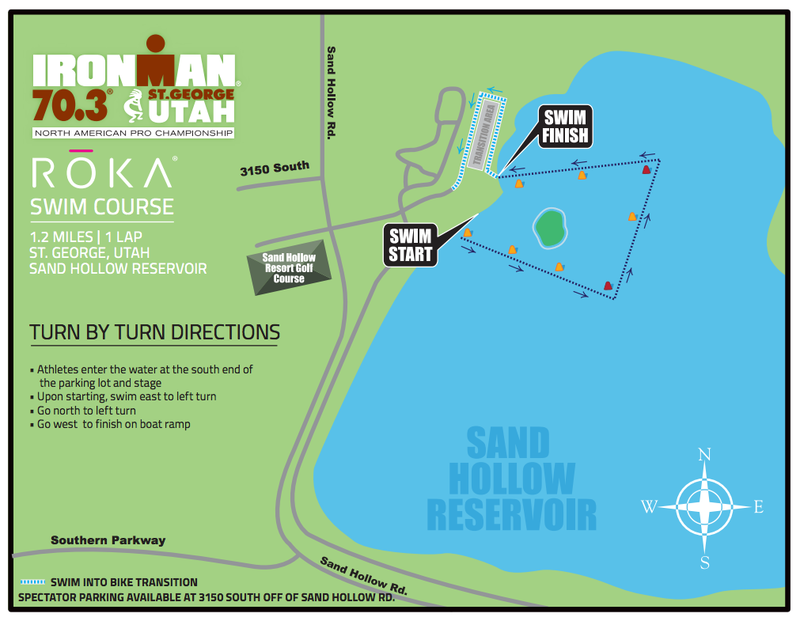 We grabbed the boys then got in the car and headed to Sand Hallow for the swim start. After arriving early for Steve, I had about an hour and a half to kill before my wave was off. I ate more oatmeal in this time and caught the beginning of his swim. The song “10 feet tall” was playing as I watched. I smiled as this was also the last song that played before we were sent off at Ironman Boulder in 2015. Maybe Ironman just needs to update their playlists, but I smiled and credited this to life’s irony and hoped it was a token of luck for us both. I took in my pre swim jel. My wave started shortly after I watched the pros round the back half of their swim. We walked to the edge and waited for the OK to swim out to our start line. We were released, we hit the water, and my breath was instantly taken away. The water had warmed to 64 degrees, but this was still the coldest water I had swam in to date and it took a minute to adjust. I made my way to the front of our line and we were off moments later. The swim went around the small island in the middle of Sand Hallow. It was 500 yards out, 850 across the back then 500 yards coming home. There was not much contact in the beginning of the swim. I had no problem finding my “line” until the water became more congested as we began catching the groups in front of us. Luckily, I was breathing to my right and did not take in water from this, however, it made the remainder of the swim tougher as we were fighting them the whole way back. 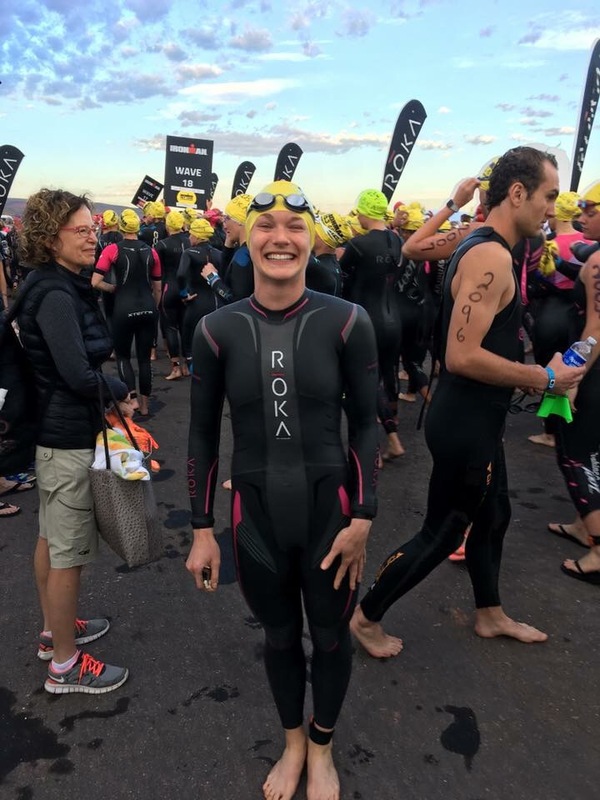 I exited the swim in 31 minutes- slower than I wanted to be – and ran through transition. In transition, I took an oral IV, threw my nutrition in my kit, and headed out on the bike course. I immediately started taking in water. 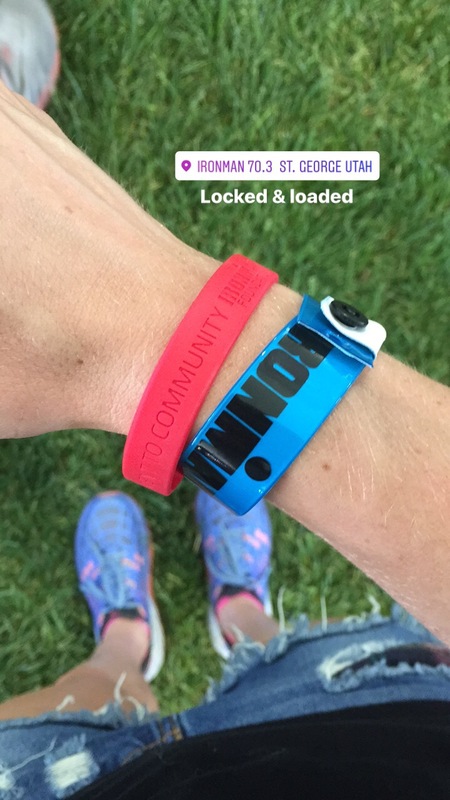 I finished my front bottle before the first aid station at mile 18. I tossed it and replaced it with a new water bottle at each aid station while continuing to take small sips from my electrolyte concentrated bottle in the back. Mile 30 or so we started our climb into snow canyon. I felt great and was riding strong, but kept telling myself to not crush the hills as I knew it would be a long day for my quads as is. Luckily, there were a lot of great flats and downhill sections where you were able to pick up a lot of speed on this course. I didn’t expect this. Somewhere into the climb, a girl rode up to me and told me there were two girls in my age group working together ahead of me. Immediately I thought nooooo…. not because I was behind, but because I had wanted to ride my own race without this knowledge. Naturally, I picked it up. I found them and yo yo-ed with them for a while. Eventually, I got fed up with the game and tried to put some distance between us. I didn’t see them again once we got into the park, but figured I would eventually as they were both strong riders. Once you were into the park, the climbing became fairly intense. While I do remember this being the point I truly started to feel uncomfortably hot for the first time, I also remember it being the most beautiful part of the entire course. If you ever get a chance to drive through Snow canyon, or better, bike/race through it… I highly recommend it. The descent out of snow canyon was arguably the best part of the course. 10 miles of down hill never felt better or more deserved than it did at this point in the race. I felt less stable than normal on my bike as I had not ridden outside and off of our wahoo trainer in months. With the cross winds picking up here, I stayed low and on my brakes on this descent. The bike also felt as if it was over and done with sooner than I had expected. I dismounted and ran into T2. I took in my second oral IV, a jel, and grabbed my run bottle on the way out of transition. I was excited to run. I could tell the heat was getting stronger so I reminded myself again to be smart no matter how much I wanted to push it. Nutrition: 1 pack of clif blocks, 2 jels, 4 bottles h2o, 1 oral IV, 1 bottle clif electrolyte+base performance mix. The run starts on a steady 2 mile climb. Nothing like racing 56 miles on the bike then running immediately up hill, right? It was fun to run out of transition and onto diagonal though as there were many spectators here. The hill sucked. It was really hot at this point, the sun was in full force, and I started to regret my decision to bypass sunscreen in transition as I could feel my skin boiling (I am allergic to the sunscreen IM uses). I knew I’d be mad if I looked at my pace so I didn’t. ever. I watched as people walked the hill in front of me and focused on making my strides short and progress consistent as I worked up it. Once we crested the top, I finally felt like my ‘run legs’ were coming around. I drank out of the bottle of clif electrolyte mix+base salt I was carrying. I hadn’t really decided how long I wanted it to last. I was glad to have it though and drank it as I felt I needed it. The run course was similar to the bike in that there were good down hills to compensate the climbing. I liked this and I also liked that the course was out and back as you were able to see everyone. I saw a few of my friends running strong and cheered them on as they were on their way to the finish. (Matt Britton, James OSullivan!) I had forgotten about the girls from the bike. I honestly didn’t remember what their kits looks like and had no idea if they’d passed me or not. I assumed they did as I knew I was running consistently but definitely not at any record pace. I took 2 waters at each aid station and dumped 1 or 2 cups of ice down my kit to stay cool. 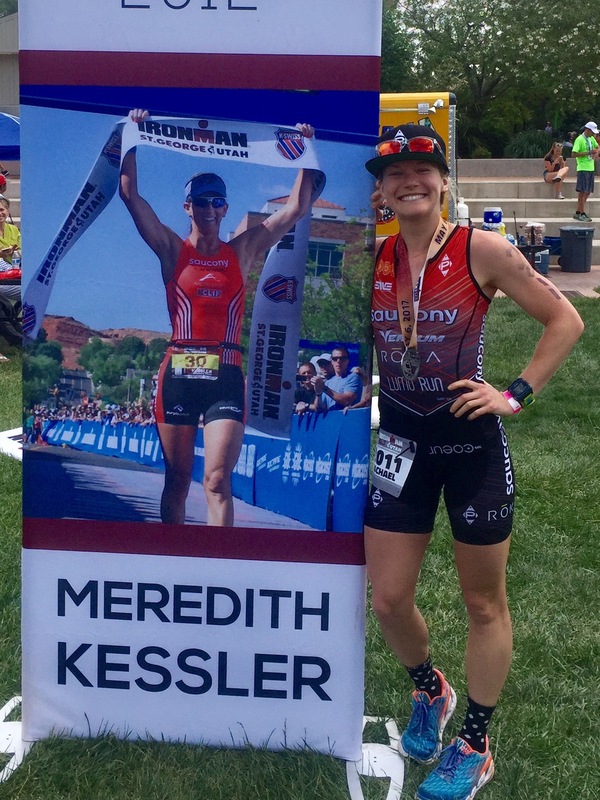 Speaking of my kit… It was Meredith Kessler’s. She let me borrow it as my Panache kit was not ready quite yet. I was surprised (but also not) that a few people recognized this while I was racing (she has won this race a few times after all). I smiled each time as I knew I was not carrying MBK’s speed, but was carrying a lot of her gumption. I’ll take it! I finished my electrolyte bottle by mile 5. I wondered briefly if this was a smart decision, but knew I had a vile of base salt for when I needed it (also in my bra.. amazing what you can fit down there when you don’t have much going on in that region). Mile 9 rolled around. I knew there was only one more solid climb before the downhill finish. I actually felt OK. I found myself wishing I had pushed a bit harder earlier in the run as it would be easy from 11 on. I ran down diagonal once again, towards the finish. I was excited but also a little worried as I never crossed paths with Steve. Amazing how you can be in the middle of a race and still be so concerned about someone other than yourself! 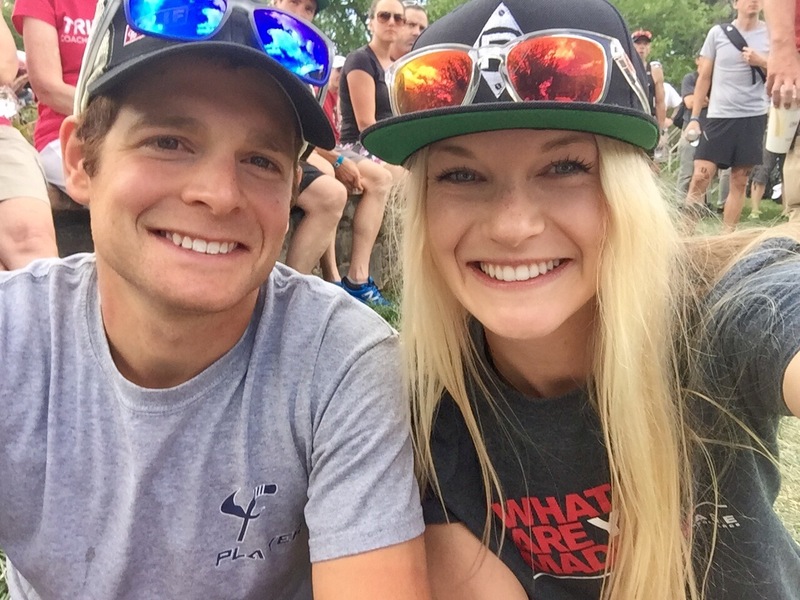 I didn’t know it at the time, but he was waiting at the finish for me after taking 13th in the men’s pro field. I also didn’t know it at the time, but I was running towards a first place finish and a qualifying spot to the 70.3 world championship. I crossed the finish and saw the clock said 5:45. 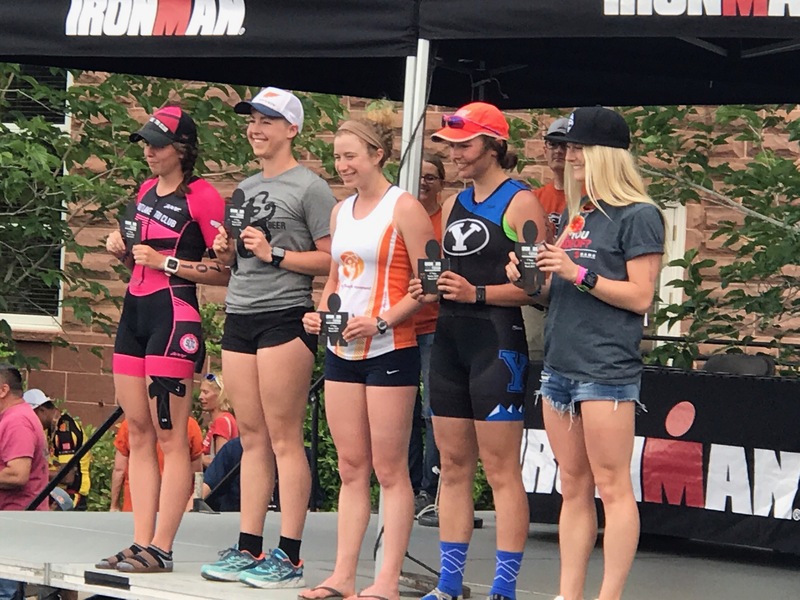 I couldn’t remember where that put my time, but was happy with my finish no matter what the time was as I was proud of my effort and the way I managed my nutrition and effort. I hugged Steve and cried the way I do when I’m too anything. too tired. too hot. too happy. It was not until I was scarfing my second post race burrito with Steve, Heather and James that I learned my official time or that I had taken first in my AG. As a college kid who makes <$13 an hour at my job, I had prepared for this to happen in some capacity. I had saved for the entry in the off chance I qualified although I truly did not believe this would be the case. 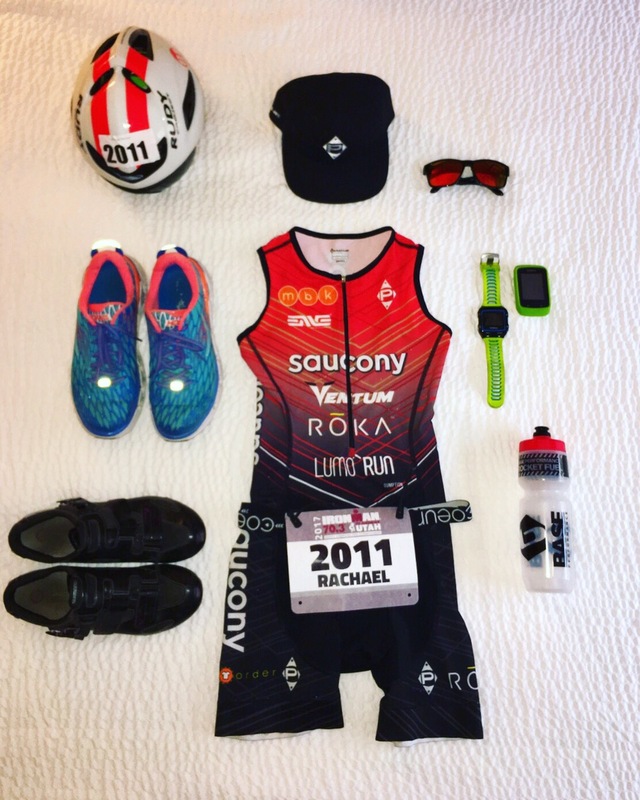 I realized that I had qualified for Kona in 2015, Boston in 2016 and then the 70.3 World Championship here in 2017 and that a few years ago, I would’ve never dreamed even one of these as a possibility for myself. As Heather said best- the place of YES continues to bring many amazing adventures to my life. 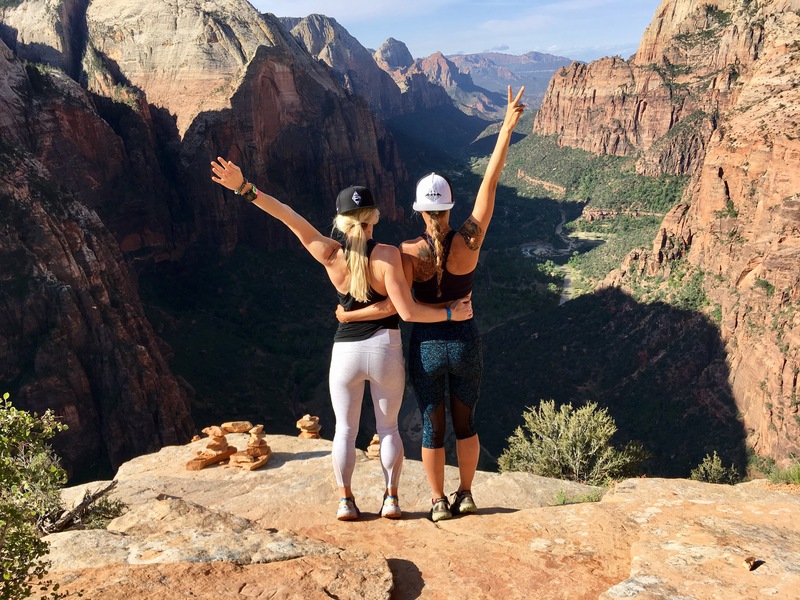 I rode this high to the top of Angel’s landing the next day and all the way down… running our hearts out, laughing and yelling through the canyons. 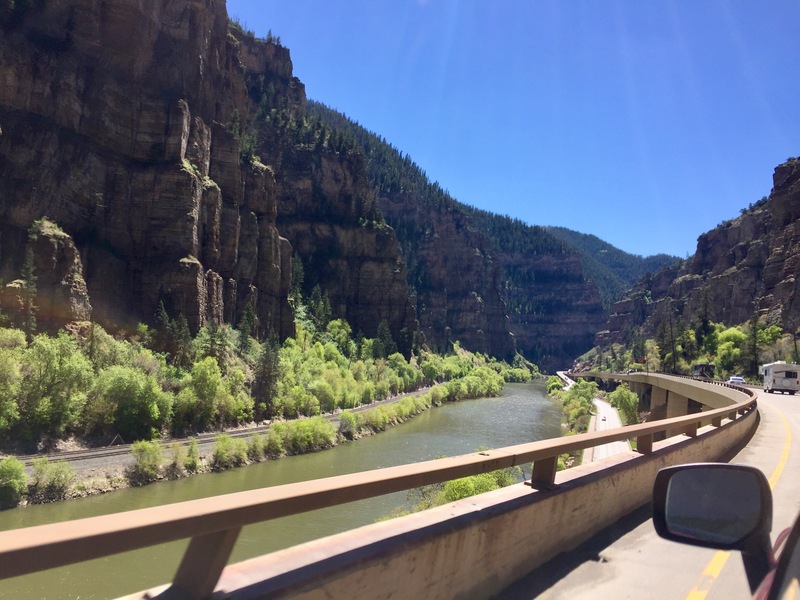 My entire experience in Utah was… well, it was hot… but it was also so refreshing and so so full of LIFE! A huge thank you to so. many. people. 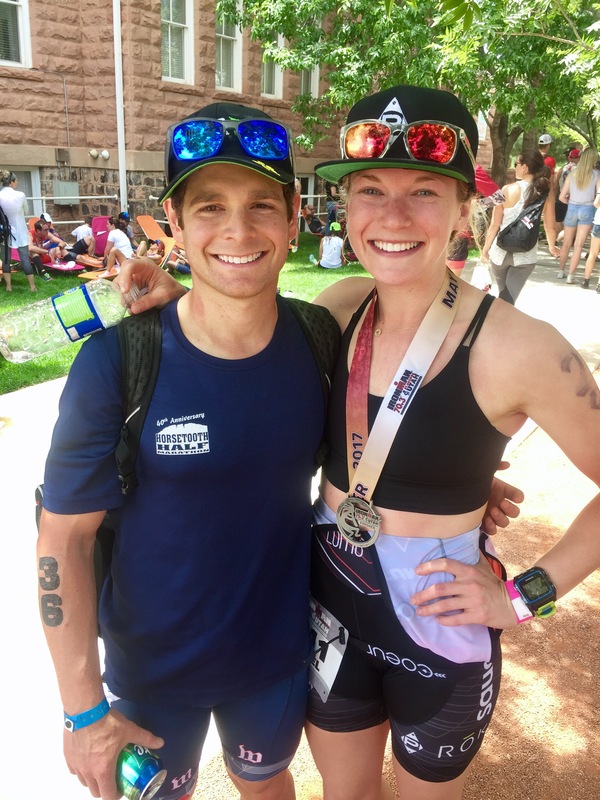 -Matt and Lauralee at Base Performance for being super great people, for the race saving salt, and for loaning me race wheels for the big day. love you guys! -Roka for helping me #FindFaster in my Maverick Pro wetsuit. -Rudy Project. Love my shades and the Boost 1 aero helmet! Thank you to my people! -Heather for making the trip to St George. I am so frigging lucky to have you in my life and was so grateful you were there with me! -Meredith Kessler for letting me wear your kit. You are my role model and this was an honor! 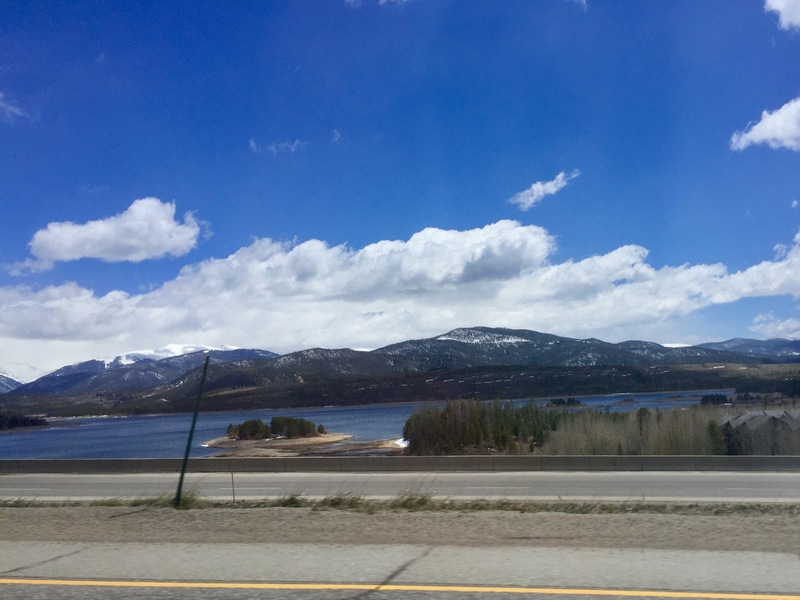 -James OSullivan for driving from Denver and being our roomie! p.s… Congrats on the Worlds slot!! -MP multisport for being a great friend and resource to me! -Eston for letting us borrow your Ruster Sports bag for Slice. This was amazing! What a fun and inspiring post!!! Congrats on qualifying.